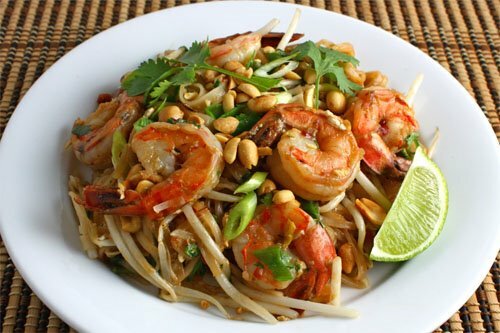 Stir-fried shrimp and rice noodles in a tasty sweet, salty, sour and spicy sauce topped with roasted peanuts. Pad Thai, a Thai style stir fried rice noodle dish, has to be one of my all time favourite meals and I always enjoy using its ingredient and flavour combinations in other dishes. With all of the Pad Thai style dishes that I have been making as of late I was reminded that I needed to update the original Pad Thai recipe along with it’s 5 year old photo. Given my obsession with Pad Thai it’s a good thing that it’s so easy to make at home and the only ‘exotic’ ingredients that you really need to track down are the tamarind concentrate and the fish sauce which can be replaced by more commonly available lime juice and soy sauce in a pinch. One of the great things about Pad Thai is it’s amazingly magical balance of sour, salty, sweet and spicy created by the tamarind, fish sauce, sugar and chili sauce. All said and told, Pad Thai really only takes less than 10 minutes to cook and things go quickly after the first ingredient hits the pan so the secret to success is in making sure that you have all of the ingredients ready to go before you start cooking. It’s so easy to enjoy Pad Thai at home, even on a busy weeknight and with this recipe it is sure to become one of your favourite meals as well! Heat the tamarind, fish sauce, sugar and chili sauce until the sugar is dissolved. Soak the noodles in water as directed on package until just pliable. Add the shrimp, shallots and garlic and saute for 2-3 minutes. Add the sauce and the noodles and mix and move to the side of the pan. You did a fantastic job with one of my favorite dishes! I can never get sick of Thai food. We are avid Thai fans, I’m going to have to give this a shot. It looks stunning and tempting and delicious in the photo. Ooooh! Pad thai is one of my favorite dishes and Pim really knows her pad thai. Looks fantastic and I’m sure it tasted even better. I love Pad Thai! It’s my favorite thing to order in, but my last attempt at making it didn’t go so well. I am going to have a go at this recipe some time. I love Pad Thai. There is a wonderful place in Chicago called Cozy Noodle that serves the most amazing Pad Thai. Ahh, I miss it. Yours looks pretty darn close to theirs. OMG, it’s only 7h00am and I’m already hungry ;-P! A marvelous dish! This is my favorite noodle, yet I never be able to make it right. Maybe I should try it again. This really is the trick to all chinese and Thai recipes…to have everything ready in advance! Looks so delicious! Phad thai is definitely one of the harder dishes to make, it never quite turns out right… unless it’s by a stroke of luck. I should take some of your tips and give it a shot. Oooh it’s only 8am but I could eat that right now LOL, it looks really lovely! i know this is a dumb question, but do you use shrimp that’s already cooked, or not cooked? This looks awesome…one of my favourite ethnic dishes. 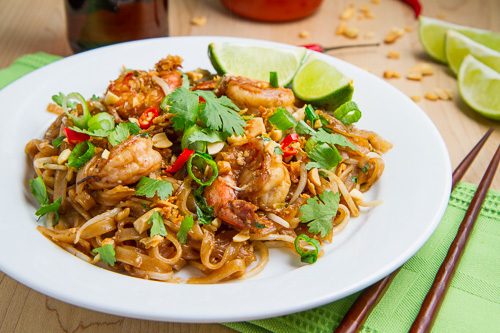 I’m like everyone else here…Pad Thai is fantastic, and I have it whenever I go to a Thai restaurant (not always great) and since I have everything on hand, except the palm sugar (must look for that)…well…thanks for sharing the recipe with Presto Pasta Nights. I’ve really been wanting to try pad thai one of these days! Looks good! Leslie: I used raw uncooked shrimp. They cook up in only a few minutes. I am sure that you could use cooked shrimp as well though. tamarind paste is used in a lot of indian dishes as well, hint hint. I love Pad Thai, I must make this! Pad Thai is one of my favorites and I’m generally incapable of ordering anything else. Yum! You really need to do a post on food photography. I can’t figure out how you always get such great lighting! Do you cook when it’s still light out, or do you have a light box, or special lights? I must know! I love your recipes Kevin. This is one of my favorite dishes – ever. You make it looks so tasty! emily: I am currently using a Lowel Ego light that allows me to take photos without having good sunlight or using the cameras flash. What a great looking dish Kevin! It’s evening meal time and I cook just eat this now. Pad Thai is great and yours looks perfect! Thanks for visiting my blog. Speaking of lighting, I just bought the Lowel Ego light set just for the winter months when I can’t get to photographing until nearly dark. I can’t wait to use it. I’m a huge fan of fresh Pad Thai and have been making it fairly frequently once I found a good recipe for it. Pretty simple to make but definitely requires everything to be prepared before starting. This and curry are my favorites and you always make them so perfectly. I need to get an ego light! Your food is always beautiful. This looks delicious! This is one my favorite dishes. Yours looks sooo good! You did such a great job that from this point forward there is no reason for take out~!! 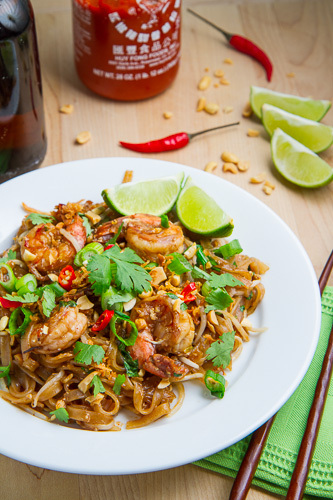 I love Pad Thai, but have never made it at home before – thanks for the recipe! My daughter and I can have Asian food every night, but its not enough food for hubby! What a beautiful pad thai! Peanuts and prawns are the ultimate in this dish I think-not forgetting fish sauce! It’s been too long since we’ve had pad thai. Yours look gorgeous. Glad to hear that the second attempt worked better than the first. Yummy! Love those big, juicy shrimp! I love pad thad! You did an amazing job with it. I agree, it’s so hard to make. The first time I tried it, I was so afraid of overcooking, I ended up with undercooked noodles. I love pad thai and your version sounds good kevin. Your Pad Thai is LOADED with ingredients! Thai food gotta be one of my favourite cuisine for its dominant flavours goes very well with my palate! I gotta give this pad thai a try. it looks like an entire plate of goodness! This is one of my favourites and you nailed it. Wow, Kevin! You’ve been cooking up a storm since I last dropped by. You’re right about Asian food, preparation is the key to getting it right. And this looks perfectly right to me. Great job! Who doesn’t love pad Thai? It’s hard to get right at home, because our stoves don’t really get hot enough to dry out the noodles easily, but your version looks delicious and I’ll give it a try. Lucky! Well, not luck, probably skill… either way, I’m jealous. I have tried 3 times now and still haven’t gotten it right. Maybe 4th times the charm? Wow! I’m going to try this. I’m not totally enamoured with the pad thai recipe that I’m currently using. I’ve tried to make Pad Thai a few times and each time it was a mess. I have a hard time with rice noodles. Did you use the ones that you soak in water? I always have a hard time getting them to soften up properly. Michelle@Life with Three: This time I used rice noodles that called for boiling for a few minutes and they worked well. The last time I used the ones that just called for soaking them in hot water and they did not work out too well. You always have some yummy looking Thai recipes… I am too lazy when I cook Thai and use three things, coconut milk, pre-made curry paste, and fish sauce… I need to try one of your recipes!!! I tried that same recipe and didn’t have much luck with it. I think that I will need to try it again and hopefully it will come out as good as yours looks! Great job! Wish I could have some of this for lunch today. Pim's book motivated me to try to master this dish as well. I've made it three times now and every time it gets easier and better. Thanks for reminding me that I should make Pad Thai again soon. It looks like you definitely have the hang of it. Ooh! Your Pad Thai looks really good in the photo, and was recommended by Saveur.com, so I'm definitely going to give your recipe a try. I'll let you know how it goes! I tried your recipe tonight and it worked really well. Thank you! I appreciated your simple, straight forward instructions. I tried making pad thai once before and it was okay, but this time, with your recipe, total success! Thank you. I love your site and this Pad Thai recipe looks great. Do they sell Tamarind concentrate in the supermarkets? I have followed and bookmarked you. Sandi: I found the tamarind concentrate in a small import shop, though most Asian/Indian grocery stores should carry it. Wow! This is great! I absolutely love Thai food and I'm excited to try and get some recipes going for my blog as well. Any other tips you can share for good Thai cooking? Pad Thai is my favourite Thai dish. I travelled to SE Asia in Easter and the Pad Thai out there was incredible! I'm always browsing the recipes on your blog and I finally got around to trying this recipe today. OMG. It worked out perfectly!! Finally!! A Pad Thai recipe that looks authentic, Easy, and AMAZING! I'm stumbling it so I can find it again and make it SOON. Thank you! This looks sooo delicious! I'm definitely going to have to try your recipe out. I love the photos that you take of your food. What kind of camera do you use? It's sad to say but I am secretly becoming a stalker of your blog recipes. LOL! Keep them coming! ToothFairy623: I am using a Canon 7D with the 17-55 f2.8 lens and I am really liking it! I tried this one for supper tonight, and my husband absolutely loved it. He actually said that it has become his new favourite dish. That's quite the accomplishment. I made the sauce with actual Tamarind paste, once I figured out how to use and apply it in the recipe, it actually came out very well. I added thinly sliced carrots, sugar snap peas cut on the bias, as well as celery and left out the bean sprouts. Gotta do what works for you. Anyway, thanks for another winner. I think this is recipe number 15 I have tried from your blog. Keep up the great work Kevin. What chili sauce to you use? Shanda: For pad Thai I like to go with sriracha. Can I put additional thai oyster sauce? Carmela Deocampo: It will change the flavour, but it should be good. Thanks Kevin. Your pad thai recipe is to die for!!' Keep up the good work ! I don't cook my rice noodles..I soak them in warm/hot water for 25 minutes…drain and continue with the recipe. Pad Thai is my favorite dish of all time! I've tried it once at home and it was NOT good haha. Will have to try this! Mmmm… I love Pad Thai. I will try your recipe for sure. I just made your Chinese Pork Dumplings tonight (again)! They are sooo good and I've actually made extras to give away as gifts. They are that good. Everyone wants me to make them for them. So thanks for the recipe! They will be a great Father's Day gift because my FIL loves them. Is there a substitute to the peanut oil? Fiona: You could use pretty much any other cooking oil in place of peanut oil. Thank you for a fairly easy delicious Pad Thai recipe! Loved it! My rice noodles were over-cooked but I am fairly sure now that I shouldn't have boiled the water first, just made it hot. The taste was awesome & authentic! Kim: Glad you liked it! Cook the noodles as directed on the package but pull them out when they are just pliable, ie. 'undercooked', as they will finish cooking when stir-fried. I cooked this last night and my dinner was a sticky mess. I didn't over soak my noodles. I followed the recipe completely and still my dinner was horrible. I think my Pad Thai days are over. Anonymous: When you say sticky do you mean that the noodles were mushy or that the were al-dente tender but they stuck to each other horribly? If you mean that they were mushy, it does sound like the noodles were over cooked. How long were they in the pan for stir-frying? In total they should be in the pan for no more than 3-5 minutes. If you mean that they stuck together horribly, then a good trick is to lightly rinse the noodles swishing them around in a bit of water before adding them to the pan. After you remove the noodles from soaking in the water they will start to dry and get sticky. Ideally you would like to get them into the pan as soon as possible but if they do get sticky, then rinsing them in a bit of water will quickly un-stick them. I'll be making pad thai today for the first time and am so excited! I remember when you made this! Great tips! I didn't get palm sugar, I'm wonderful it regular sugar would work? or even honey!? The Little Ferraro Kitchen: Brown sugar would be the best substitute but regular sugar will work as well. Enjoy! Kevin, what fish sauce do you use? I made pad thai another day but it had this nasty fish sauce after taste. I was wondering if I need to buy different fish sauce. Your recipe looks great! Thanks. Elina: I use 3 Crabs and I like it, though I do not have a lot of selection here so I have not really been able to compare it. You can cut back on the amount of fish sauce and replace some or all of it with soy sauce to reduce the fish flavour. You can also use more lime juice which helps cut through the fish flavour. Thank you Kevin. I will try your suggestions. I couldnt find 3 crabs today though..may need to check other asian stores or online. Thanks for listing a substitute for the tamarind concentrate. I haven't been able to find it and every recipe I've seen calls for it. Can't wait to try this. We just finish our dinner and it was delicious and easy to make, I just add an extra chili sauce because we like spicy food. This Pad Thai recipe is a keeper, thank you. Turned out great – thanks! Kevin…I'm stopping by today to compliment you on an awesome Pad Thai recipe which I made last night…the flavours were spot on! Made mine with tofu (meatless Monday) and the hubby and I totally enjoyed it with leftovers for lunch today. This is the standard for me. Thank you! Kellie Trudel: I'm glad you like it! Hello! I know this is an old post, but can you tell me what you mean by "chili sauce?" Thanks! Melissa Flake: Use a chili sauce like a sriracha or a sambal oelek or tabasco sauce, etc. Enjoy! I love this Recipe! Fairlly easy to make..Thank you for sharing this.